LISTED BELOW ARE THEMES FOR PAST SEASON 2016. NEW 2017 plans are being made at the present time and Theme Announcements will be made here soon! Explore a different Earth Element each day through games, crafts, stories, science explorations and hands-on activities. Tracking, Outdoor Cooking, Hiking, Turtle Research, Tree Census, Canoeing, Archery, Shelter Building, Knife Test, Survival Skills, Weaving & Basketry, Leather Medicine Pouches, and more. Be sure to stop by our FACEBOOK PAGE and tell us what activities you are looking forward to this summer! In addition to the daily themes, we have Free Choice Activity Periods several times each session. 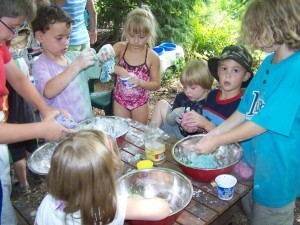 This provides campers additional opportunities to participate in the session’s themed activities. Together with the camp standard activities of hiking, canoeing, pond and creek exploration, outdoor shelter building, nature crafts, cooperative and camp games, and farm animal care, campers are sure to experience camp days full of fun and healthy choices. All campers get to choose the activities they participate in. Camp staff works hard to ensure that campers participate in activities in which they find success. Campers have plenty of time in their day to spend time at their group sites in the woods, explore, and spend time engaged in healthy creative play with friends.